The Time Machine was a very unexpected read for me. By unexpected, I mean awesome. The Time Machine is not the first book by Wells I have read. I loved [b:The War of the Worlds|8909|The War of the Worlds|H.G. Wells|http://d202m5krfqbpi5.cloudfront.net/books/1320391644s/8909.jpg|3194841] when I read it. I was actually surprised by how much I loved that one, too, since I had seen the 1953 movie a few times and had an idea of what I would encounter.I will jump right to the best part of The Time Machine - it was a scary read. I assumed it would be all science fictiony, maybe a little boring at times. No. 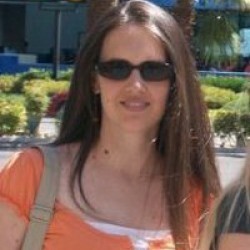 The Time Machine made me down right giddy as a reader. The time traveler in The Time Machine goes almost a million years into the future, and Wells offers a lot of consideration towards how humans will evolve and why. It's an amazing read for something published in 1895.I need to quit making assumptions before reading anything by Wells because apparently I'm a huge fan.Another thing I really loved about The Time Machine was seeing exactly where pop culture gets its representation of time travel today. We see it all of the time in movies - the days and nights and the scenery progressing around the person doing the time travel. 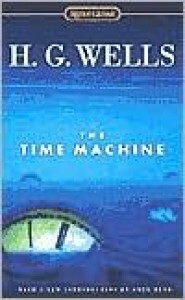 Wells describes it so perfectly in The Time Machine, it's become a standard mechanism for displaying time travel on the screen.There are so many reasons I would recommend The Time Machine so if you are interested in scifi, horror, or simply classics in general, The Time Machine is a quick, surprising read. It's in the public domain so you can download it for free pretty much everywhere. I think The Time Machine and The War of the Worlds are the only two books I have read by Wells, but I have got to change that. [b:The Island of Dr. Moreau|29981|The Island of Dr. Moreau|H.G. Wells|http://d202m5krfqbpi5.cloudfront.net/books/1320523623s/29981.jpg|68894] is on my bucket list as well so I will be reading that one next.